Kid-tested comfort and durability. Tough, yet soft, vinyl covers are easy to clean. 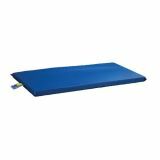 Polyfoam padding offers superb support. All KinderMats fold into four panels for easy storage. Low priced, but with all the essential features. 5 mil vinyl cover. Folds to 11" x 19". Red/Blue. 5/8" x 19" x 45". One year warranty. Space-saving and portable, narrow enough to fit through most doorways. 1" square. 16-gauge powder-coated steel with 3" diameter locking casters. 10-year warranty on fame, 1-year on casters. Additional shipping charges apply. Turn a cot into a dolly. 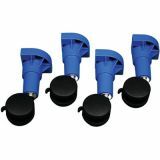 Set of 4 legs with pre-assembled locking casters. Available in all legs colors. All virgin materials made in USA. 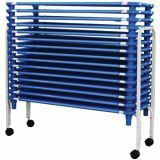 Sewn, fabricated and assembled in USA Frame of bend-proof, 18 gauge cold-formed steel has a 10-year warranty. Cover is made of Texron. A non-sag, open weave, extremely durable fabric that meets strict California Fire Code #117. Legs are made of high impact polypropylene plastic. So strong, we guarantee them for the life of the cot! Sturdy enough for children up to 80 lbs. Lightweight–weighs only 7 lbs. No screws, nuts or other small parts. Stacks neatly for easy, safe storage. Lace-up covers can be tightened periodically if desired. Name tags included. Replacement covers available Comes with acrylic name clip. Legs available in 4 different colors. Standard Size 52"L x 22"W x 5"H. Additional shipping charges apply. All virgin materials made in USA. 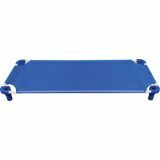 Sewn, fabricated and assembled in USA Frame of bend-proof, 18 gauge cold-formed steel has a 10-year warranty. Cover is made of Texron. A non-sag, open weave, extremely durable fabric that meets strict California Fire Code #117. Legs are made of high impact polypropylene plastic. So strong, we guarantee them for the life of the cot! Sturdy enough for children up to 80 lbs. Lightweight–weighs only 7 lbs. No screws, nuts or other small parts. Stacks neatly for easy, safe storage. Lace-up covers can be tightened periodically if desired. Name tags included. Replacement covers available Comes with acrylic name clip. Legs available in 4 different colors. Toddler Size 40"L x 22"W x 5"H. Additional shipping charges apply. 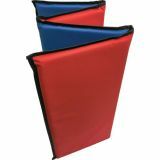 Creative Colors® Standard Rest Mat, 1-section, 2" x 24" x 48"
All virgin materials, made and assembled in the USA. Strong, 10-mil vinyl, won't go flat! Foam density D-31. Inside sewn seams provide high durability, sewn on Tyvek name tag, meets strict Fire Code CA Bulletin 117. 1 Year Warranty. 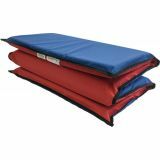 Creative Colors® Standard Rest Mat, 3-section, 1" x 24" x 48"
Creative Colors® Standard Rest Mat, 3-section, 2" x 24" x 48"
All virgin materials, made and assembled in the USA. Strong, 10-mil vinyl. Won't go flat! Foam density D-31. Inside sewn seams provide high durability. Sewn-on Tyvek name tag. Meets strict Fire Code CA Bulletin 117. 1 Year Warranty. 3-section 2" x 24" x 48”. 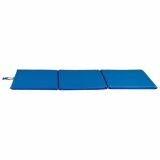 EnduroMat™ KinderMat®, 1" x 24" x 48"
EnduroMat™ KinderMat®, 2" x 24" x 48"